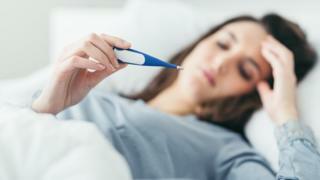 Hospitals in England are now seeing very high rates of patients with flu, according to Public Health England figures. A sharp rise in cases seen by GPs in the past week - up 78% on the week before - suggests it could be the worst flu season for seven years. But PHE said the current levels of flu were "not unprecedented". Deaths from flu remained static with 27 in the past seven days. Around 5,000 people were admitted to hospital with flu in the first week of January, based on PHE figures for 22 out of 137 trusts. Prof Paul Cosford, medical director from Public Health England, said: "The levels of flu being seen are high and of course that is contributing to the pressures in the NHS, but they are not unprecedented levels." He also suggested the coverage of the so-called Aussie flu outbreak was a little misleading, saying that while it was circulating at "significant" levels there were two other strains that were also causing problems. Should we be worried about 'Aussie' flu? These strains are an unknown type of influenza A and influenza B - which is normally a milder strain - but appears to be affecting older people in care homes. The H3N2 strain - an influenza A virus - has been dubbed 'Aussie flu' because it is the same strain that recently caused big problems for Australia during their winter. This year's flu vaccine is designed to protect against this strain and some other ones. Figures in Scotland show a doubling of flu cases in the past week but mortality rates related to the virus were still said to be low. However, an 18-year-old student from Wester Ross died after her flu developed into pneumonia. In Wales, a large rise in flu cases has prompted advice to stay away from some hospitals. The rate of hospital admissions in England rose by over 50% in the first week of January to 7.38 per 100,000. In the same week, the GP consultation rate was 37.3 per 100,000 compared to 21 per 100,000 the week before. Nearly 22,000 patients went to see their GP with flu in the first week of 2018, the Royal College of GPs said, and there was also a rise in people seen with the common cold, acute bronchitis, respiratory system diseases and asthma. Flu symptoms can come on very quickly and can last for a week or more. Symptoms include a fever (temperature above 38C), aches, headache, tiredness, a chesty cough, tummy pain and loss of appetite. Children can also get pain in their ears and appear lacking in energy. Flu can be particularly unpleasant for certain people, such as the over-65s, pregnant women and those with other serious health conditions. Health officials say getting the vaccine every year is the best way to protect against flu.